I’ve just come back from my 5th trip to Oracle OpenWorld. While there is something very special about your first trip to OpenWorld, this has been my favourite trip of the lot. In previous years I’ve blogged about what’s been going on every day, but for me, twitter and @jarneil is where I tend to be more active these days, but I thought I’d give a general overview of my OpenWorld experiences this year. I was quite lucky this year to get a presentation selected “Exadata From Installation to Go Live: Experiences From Banking And Retail”. I was delighted by the number of attendees who turned up to it, well over 150 I reckon. while I have presented many times at various UKOUG events over the year, but I feel it’s slightly different presenting in the US, the attendees were very keen to ask questions and many came up to chat at the end. It certainly makes it all feel worthwhile as a presenter, and I’ll be submitting a presentation for next year for sure. OakTable World has really become a fixed staple of my OpenWorld experience, a conference within a conference, where some of the most knowledgeable folks in the Oracle community present in a bit more technical detail than you get in the general conference. It really was tremendously well organised by @kylehailey and it was a real privelege to be able to attend this. The big announcement in the Larry Ellison keynote was of course the new Oracle database in memory option. While it sounds like this is a long way from being production ready, it does sound like potentially an awesome feature. It did however make me wonder whether it might start to cannibalize Exadata sales: why worry if you don’t have smart scans when you are querying your hot data in memory. To ensure offloading occurs for different versions of databases running on the compute nodes there is going to be a bit of an architectural change with the software running on the cells, with essentially an offloading process for the different database versions. It sounds like this may take a while to appear, and it’s a bit disappointing to say the least, that 12c has been released with no offloading support. I thought I’d mention a few of my favourite presentations, in addition to the OakTable World stuff above, that I saw. First up is from Maria Colgan and Jonathan Lewis called optimizer bootcamp. It not only was highly educational, but was also superbly entertaining – definitely the outstanding presentation of the week. I also enjoyed “Oracle Exadata: What’s New, What’s Coming” by Juan Loaiza. Juan is an excellent presenter and comes across as highly knowledgeable about the product. Finally I’d like to mention “Solving the Toughest Oracle Exadata Problems by Using Tips from Oracle Development” mostly presented by Scott Heisey. This really did give you a lot of tips on where to look and what to do when something goes wrong with your exadata. If the slides for this become available, I’d highly recommend taking a look if you have to manage an Exadata box. What truly made this year a memorable experience though, was the social side. After 5 years, I now know quite a few people and really it is superb being able to talk to some of the smartest folks in the Oracle community. It is this that really made it a great year: from the Oracle Ace Dinner and speaking to a whole bunch of Enkitec folks, to the pythian party and one of the best stories I heard at OpenWorld from Karl Arao, to an e-dba dinner and some great stories about Oracle UK from James Anthony and finally the great blogger meetup and speaking with Luca Canali, oh and not forgetting dinner at the Franciscan Crab to the finale with Martin Nash in the W and a couple of mojhito. It really is the people that makes Oracle OpenWorld a great conference to attend! So many thanks to @e_dba and the Oracle Ace program, without their support, I could not attend. The wait is over and Oracle 12c has finally arrived. Of course there is a lot of interesting and useful looking new features, but one of the eye-catchers is the major architectural shift to multi-tenancy with the Container Database and Pluggable Database features. To actually create a container database with pluggable databases is really straightforward as shown here by Matthew Walden. I must say I’m liking the new dbca, it feels just that little bit incrementally nicer to use. Of course, one of the big ideas behind the multi-tenancy idea is to ramp up the amount of consolidation you can squeeze out of a given server. Using a multi-tenant database you can consolidate more databases onto a given amount of server memory and cpu. I’m doing a lot of that on Exadata at the moment, and I can see that it’s going to be really useful in certain scenarios for this. However, I’m not expecting 12c Exadata support anytime soon! The other big driver for multi-tenancy is in manageability – the abstraction of user data from the oracle supplied metadata enables a lot of possibilities that did not exist previously. What I wanted to show in this post was how easy it is to create a clone of a pluggable database. I’ve worked a lot with developers in the past, and one of the things I learned during this time is that developers can’t get enough copies of the database they working on. I don’t think this is a bad thing. In fact, I always took it as read that as the DBA it was my role to actually help the developer develop the best code they could. Certainly makes for less painful releases. So, I was all in favour of giving developers the tools and resources they needed to develop good code, and this very much included copies of the databases they were working on. Testing is a great thing! Currently you can only create a clone of a pluggable database if that pluggable database is read only. This to me seems a bit of a limitation. I expect in a future release this limitation will be lifted. Simple. This clone took 10 secs. The size of the database that was being cloned was 1.3G. The create pluggable database command has a lot options, but this was the simplest syntax I could see to create a clone of a pluggable database. You need the file_name_convert so that the datafiles from the pluggable database you are cloning can be put somewhere else. And this is something to bear in mind. It really is copying the datafiles from the pluggable database you are cloning. That could be a lot of space required. ORA-65025: Pluggable database PDB1 is not closed on all instances. So we can see we have to have the pluggable database closed before we can drop it. To actually drop it took hardly any time at all, subsecond! As I eluded to earlier on of the big drawbacks of using this method is that the space requirements can become vast if you start making lots of clones of large databases. What I’ve used in the past is using snapshots to drastically reduce the storage requirements when creating 10’s of copies of the same database. You essentially store 1 copy of the full datafiles and deltas of changes for each of the copies. It’s great to see there is a snapshot option on the create pluggable database command! However you’ve got to be on the right storage ACFS or Direct NFS. I’m looking forward to testing this soon. The new multi-tenancy architecture is a major shift for the Oracle database, and this just one of them. This blog posting is entirely the credit of Frits Hoogland, who pointed out to me that this was possible. I managed to delete a datafile, that while it had been created in a completely stupid location, was very much in use. I’m sure we’ve all been there, I mean who hasn’t run rm -rf somewhere they shouldn’t have? When I subsequently checked the database and saw no flashback database, I realised this was going to mean the database being recreated. It was non-production of course, so no real big deal, but still a bit of work none the less. Thanks to Frits’ suggestion though, I could have saved myself some of that work! dr-xr-xr-x 7 oracle oinstall  0 Mar  6 13:38 ..
dr-x------ 2 oracle oinstall  0 Mar  6 13:38 . This is such a cool trick. I still would consider a very last option, particularly in a production environment. In fact, you don’t really want to be creating tablespaces in the /tmp directory or any other stupid location in the first place! I’ve worked on 24×7 systems for more than a decade, and I have a real dislike of downtime. For one, it can be a real pain to agree any downtime with the business, and while RAC can and does help when you do work in a rolling fashion, there is still risk. The promise of online patching has been a long one, and it is only recently that I dipped my toe in the water with them. Unfortunately, they are not a panacea, and in this blog posting I’m going to share some of the downsides. Of course not all patches are online, if they are the README associated with the patch will have an online section in how to apply the patch, also when you uncompress the patch there will be an directory called online. Installing and enabling the online patch 'bug10219624.pch', on database 'TESTRAC1'. Instantiating the file "/u01/app/oracle/product/11.2.0/db_1/.patch_storage/10219624_Dec_20_2012_02_13_54/rac/copy_files.txt.instantiated" by replacing $ORACLE_HOME in "/u01/app/oracle/product/11.2.0/db_1/.patch_storage/10219624_Dec_20_2012_02_13_54/rac/copy_files.txt" with actual path. Instantiating the file "/u01/app/oracle/product/11.2.0/db_1/.patch_storage/10219624_Dec_20_2012_02_13_54/rac/copy_dirs.txt.instantiated" by replacing $ORACLE_HOME in "/u01/app/oracle/product/11.2.0/db_1/.patch_storage/10219624_Dec_20_2012_02_13_54/rac/copy_dirs.txt" with actual path. Now, I know you are meant to give connection string details like username/password, and can then apply to all instances in a cluster at the same time, but on some systems I work on, I do not have this information, and rely on OS authentication only. This can lead to some pain. Installing and enabling the online patch 'bug10219624.pch', on database 'TESTRAC2'. I’ve found rolling back to be slightly more problematic on the remote with o/s authentication. The rollback always removed the patch from the home across all nodes and always removed it from the instance on the local node. While there is an opatch method documented to then stop being enabled in an instance, very similar to the enableonlinepatch above (it’s Disableonlinepatch) I found it did not work with some patches, though opatch reported success, the patch was still enabled. Another point to note, restarting an instance does not remove an online applied patch, there is a directory under the $ORACLE_HOME, called hpatch that has the online applied patch libraries. That oradebug patch list showing removed then reverts to “No patches currently installed” upon instance restart. This really caught me out, patches applied online are completely incompatible with a subsequent running of opatch auto. I had the situation recently whereby I had applied a patch online and then later wanted to run opatch auto to apply further patches. Before running opatch auto I always run the check for conflicts, and this did not give me a clue that opatch auto would not work with the online applied patch. Patches [   14632268   12880299   13734832 ] will be rolled back. OPatch cannot roll back an online patch while applying a regular patch. Please rollback the online patch(es) " 14632268" manually, and then apply the regular patch(es) " 14474780". Please rollback the online patch(es) " 14632268" manually, and then apply the regular patch(es) " 14474780"
Yes, it’s not that difficult to fix up, the frustrating thing here is the prerequisite checks did not show any issues. It’s pretty clear that the opatch auto developers have not given any thought how to properly handle an online applied patch, or the online patching developers have not considered the consequences of online patching with a future opatch auto. Online patching is almost like the holy grail, nobody wants downtime, but I just don’t think the current online patching technique is quite fully there yet, and it really doesn’t play at all with opatch auto. This blog posting is very much a follow on from the previous entry on how data compressed with Exadata HCC compression behaves under changing table definitions. Many thanks to Greg Rahn for the comments on the previous blog entry on a simple mechanism for determining whether the compression level has changed or not. In this blog posting we add a column to an HCC compressed table and we observe whether the number of blocks in the table changes or not. This will be our starting point for each of the 3 ways of adding a column. We will always start with this table consuming 60 blocks. We will then add the column and then determine how many blocks the table is consuming after the column has been added. If the table has undergone decompression from HCC compression the number of blocks will go up, conversely if it has not then the number of blocks will remain static. As we can see the number has absolutely rocketed up from 60 to 192, this is indicative of the fact the data is no longer compressed with HCC compression. We see that with thetechnique of including a not null clause on the add column with a default value that the number of blocks has not changed, and hence the data must still be HCC compressed, as confirmed with the DBMS_COMPRESSION.GET_COMPRESSION_TYPE procedure. Essentially if you can have any column that you add to an HCC compressed table to be defined as not null then you can be sure that specifying a default value will not undo your HCC compression. If you do need to allow nulls, then getting away without a default value would be best and perhaps only updating recent data rather than all historical data would at least preserve some data as being HCC compressed. Be aware that uncompressing HCC compressed obviously can lead to a large increase in your storage requirements. While everyone is aware of the issues of mixing EHCC compression and OLTP type activities, I had a customer who was interested in finding out what happens upon adding a column to a table that has EHCC compression enabled on it. As I could not see any definitive statements in the documentation on this particular scenario I ran up some tests to see the behaviour. Oh Dear! Our compression has changed. This maybe is not that surprising. But what if you have a requirement to add a column but with no default value, and you just want to update more recent records, can we avoid downgrading all records from HCC compression? So we are using the same table and data as before. We will focus on two rows, one in the 2011 partition and one in the 2012 partition. So that is great, we have a way of evolving table definitions without having to suffer the whole set of historical data to not be in HCC compression. I recently had the chance to create some diskgroups on an Exadata box outside the standard installation procedure, while this is not necessarily Exadata specific, I thought the technique of using ASMCA silently on the command line to create the diskgroups was sufficiently novel for a short blog posting. If for nothing else but to remind myself on how to do this in future. Note I’ve edited the above to have returns after every couple of disks for readability. Of course you can specify your required redundancy level and differing compatibile parameters. You can see the 3 cells here that make up an Exadata 1/4 rack. You can also see the Infiniband IP addresses of each of these cells in the path to each griddisk. You can see however the nice mapping between each of the griddisks names and the storage cells upon which they reside (e.g. DATA01_CD_00_cel01 – DATA01 griddisk created on Celldisk 00 of storage cel01) – I really like this naming feature of Exadata it makes life that little bit more straightforward for the administrator. Only other thing to be aware of, when creating the DBFS_DG diskgroup all those CD_00, and CD_01 griddisks don’t exist as this is the storage on each cell is used for the systems disks. Had a great day at the UKOUG Exa.. Day yesterday. I was happy by and large with how my presentation went, it was a bit irritating having some technical issues with laptops and projectors, but hopefully the audience was entertained enough to not let that have annoyed them too much. I’ve included a link to the powerpoint of the presentation, you really need to read the notes to gain an understanding of what I was trying to say! Apologies that it is a near 7MB download, but I’d be happy to answer any questions you may have on it, and all feedback welcomed. As for the day itself, there was a great atmosphere at the event, and many, many familiar faces from UKOUG events of the past, in particular many faces from the RAC SIG. I particularly enjoyed Frits Hoogland’s presentation on Exadata and OLTP. He even alluded to the fact that Exadata smart flash logging may not be as beneficial to OLTP as you may be lead to believe. The other take away message from his presentation was to test everything – don’t take things for granted! Tanel Poder was great to listen to and I think he could have gone on for many hours more talking about Exadata performance. The day rounded off with great chat and beers for all the delegates courtesy of e-dba. 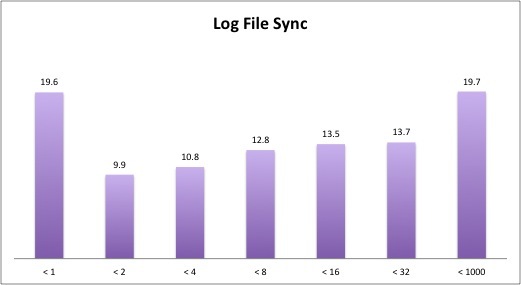 With the 11.2.2.4.0 release of the Exadata storage server software (and providing you are at least at 11.2.0.2 BP11), you will have the opportunity to utilise Exadata Smart Flash Logging. I thought I’d take a look at how much (if any) improvement this feature would provide to a busy production environment. Have a look at this blog entry on Exadata Smart Flash Loggin by Luis Moreno Campos for an introduction on how it works. Basically you now issue two writes, 1 to flash 1 to your disk based redo logs, fastest write is the winner. First we can see that on this cell, there is a flashlog created of size 512M. It is carved out of each the 16 flash doms in the cell. Consequently this reduces the amount you have for your flashcache, though it’s a very small reduction. That is saying how much data is being written to flash by smart flash log. Well, that sounds great, but it’s not quite so simple. Remember writes go to both flash and disk. Is saying this number went to flash first. Oh, that’s not a great improvement! I make that 2.7% writes went to flash first. Finally a word on the FL_PREVENTED_OUTLIERS, this is saying there was 415 writes on this cell that would have taken more than 0.5 secs if there was no flash logging in place. We see the vast majority of writes are under a 1ms. This was also the case before the flash logging as well. It has not improved this at all. Eurgh! is the only way to describe this. I think Kevin Closson has covered this a mere half-decade ago! 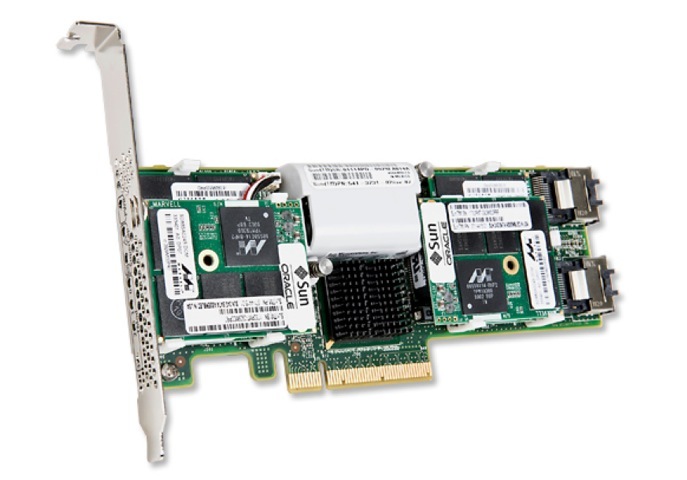 Exadata flash storage is provided by the Sun Flash Accelerator F20 PCIe card shown above. Four of these cards are installed in every Exadata storage cell. There is a Documentation set available to peruse. You can see they are bunched into 4 groups of 4 8:, 9:, 10:, and 11: This is the fact that the 4 cards each have 4 FMOD, so on every exadata the flash is presented as 16 separate devices. Copyright (c) 2009 Sun Microsystems, Inc. All rights reserved..
applicable provisions of the FAR and its supplements. The output above has been edited for brevity. You can even have a look at the devices /proc/mpt/ioc1 on the filesystem. slotNumber:             "PCI Slot: 5; FDOM: 3"
I’ve edited the above for just the detail on the FLASH_5_3 device, basically the last FDOM slot on the highest numbered PCI slot. You can see the size of each of the FDOMs at 22.8880615234375G which multiplied by 16 gives 366.21G. I’ve edited the output above to just one riser card, just to prevent boredom. You are looking to ensure the value , here showing value = 9844.000 Hours is less than the upper_noncritical_threshold, which in this case it is. Otherwise have the ESM replaced if this value is greater than the threshold. So far I’ve found the flash cards on both V2 and X2-2 to be very reliable, I’d be interested in hearing other thoughts on their reliability.